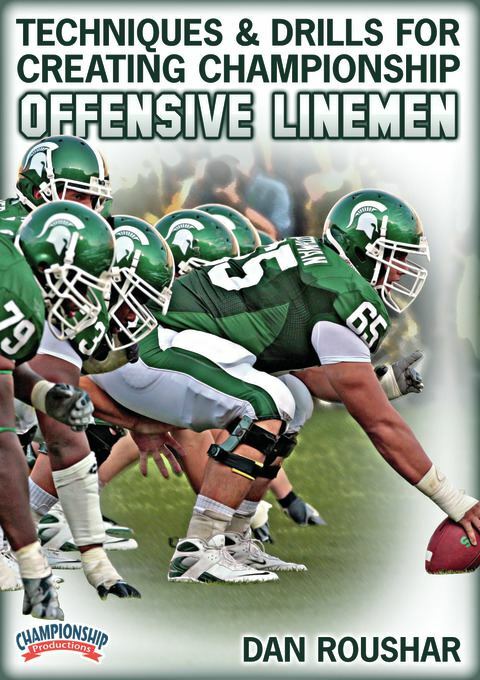 Michigan State Offensive CoordinatorDan Rousher has developed a video that details the fundamentals of offensive line play. These techniques have helped Michigan State to dramatically revive its offensive rushing output. You will gain a competitive edge when teaching these techniques to your players and develop a sound and consistent offensive line. Roushar establishes a strong fundamental base and teaching progression for the drive block. He then demonstrates how all other run block schemes eventually turn into a drive block. Your lineman will become better drive, reach, and down blockers and learn to master the execution of a full block from start to finish. Roushar uses high quality practice video to teach you his drill progression sequence. Aerial and field-level camera angles clearly illustrate proper techniques. This DVD also includes game footage to demonstrate how these techniques are put into use in a game.This DVD is valuable for coaching all levels of football and will allow your offensive lineman to develop sound and efficient skills.